LINDALE, Texas, Dec. 6, 2018 /PRNewswire/ -- Today, as former President George H.W. Bush is laid to rest in Texas, his Points of Light organization honors a family that has committed their lives to serving those in great need. Dr. Gary Parker, his wife, Susan, and their children, Carys and Wesley, have received the Daily Point ofLight Award, which celebrates the power of the individual to spark change and improve the world. "We are proud to award the Parker family for their lifelong commitment to service with the Daily Point of Light Award," said Natalye Paquin, Points of Light president and CEO. "They are symbolic of the great humanitarian spirit that shows up in times of need, which we hope will inspire others to give their time, talent and resources to build community." The Parker family serves with Mercy Ships, an international charity that uses hospital ships staffed by volunteers to deliver free surgeries and life-changing medical care to people in need. Dr. Gary Parker is the chief medical officer of the Africa Mercy, the world's largest charity hospital ship. In its 40-year history, Mercy Ships has provided more than $1.53 billion in services, directly impacting more than 2.71 million people. 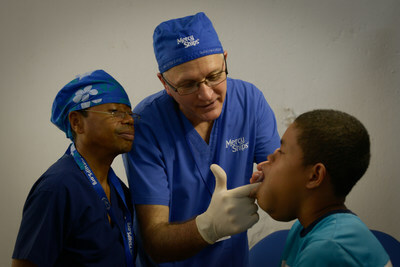 In 1986, after five years working as an oral and maxillofacial surgeon, Dr. Parker wanted to make a difference in the world. He volunteered with Mercy Ships for what he thought would be three months of service — but since then he has never left the organization. He met his wife onboard, and they married and raised their two children while continuing to volunteer full time on the ship. Susan Parker has served in several key roles, including training director and the Africa Mercy's senior chaplain. Gary and Susan Parker have served onboard for more than 30 years, a true embodiment of the dedication to service that the Daily Point of Light Award recognizes. Carys, 24, and Wesley, 20, grew up onboard and graduated from its school, the Mercy Ships Academy. "'Dr. Gary' is a world-class surgeon serving Africa's most needy – those who have almost no access to healthcare," said Mercy Ships founder Don Stephens, who was also a Daily Point of Light Award recipient in 2014. "Every one of his patients has looked into Dr. Gary's eyes and seen his love, compassion and care. Dr. Gary is a role model for all of us." "We are honored and humbled to accept the Daily Point of Light Award, and do so on behalf of all of the ship's crew and staff worldwide who volunteer their time with Mercy Ships," Dr. Parker said. "Five billion people in the world live without access to safe, timely, affordable surgery. Our family is proud to be part of an organization working to change the global surgery crisis by transforming lives and extending dignity to thousands of people in great need." In this way, Mercy Ships makes a difference long after the hospital ship leaves port. Mercy Ships works with each host country to build a five-year partnership model. The first two years are spent analyzing the country's needs and planning for the ship's arrival. The ship then docks in a single port for 10 months at a time, providing free surgeries and other life-changing medical care to thousands of people. After the hospital ship departs, Mercy Ships continues to work with the local government for two years of ongoing support, development of the local medical infrastructure and evaluation reporting to guide that nation's future efforts. This work is done almost entirely through the efforts of volunteers like the Parker family, with a crew of more than 400 people from more than 40 nations who give their time and talents to serve in medical and nonmedical capacities, including surgeons, nurses, cooks, electrical technicians, housekeepers, engineers, anesthesiologists, hairdressers and dentists. The Africa Mercy is currently docked in the port of Conakry in the Republic of Guinea to provide relief to the backlog of surgeries left in the wake of the Ebola crisis of 2014. Guinea was among the three countries most severely impacted by the epidemic. That crisis killed more than 11,000 people, including more than 500 healthcare professionals. This represents a significant loss in a profession that already was suffering from a lack of personnel and resources in one of the poorest regions of the world. In Guinea, Mercy Ships will provide more than 2,000 life-changing surgeries onboard the hospital ship; treat more than 8,000 dental patients at a land-based clinic; and train and mentor more than 700 local healthcare professionals. Officially endorsed by the late Nelson Mandela, Desmond Tutu, Jimmy Carter, Bill Clinton, George W. Bush and Tony Blair, the global nonprofit has delivered professionals from more than 40 nations directly to the shores of low-income nations. The Africa Mercy is an extraordinarily efficient platform, allowing the organization to deliver quality care to regions where clean water, electricity, medical facilities and personnel are limited or nonexistent. Points of Light – the world's largest organization dedicated to volunteer service – mobilizes millions of people to take action that is changing the world. Through affiliates in 250 cities across 37 countries and partnerships with thousands of nonprofits and corporations, Points of Light engages 5 million volunteers in 20 million hours of service each year. We bring the power of people to bear where it's needed most. For more information, go to www.pointsoflight.org. Mercy Ships uses hospital ships to deliver free, world-class healthcare services, capacity building and sustainable development to those with little access in the developing world. Founded in 1978 by Don and Deyon Stephens, Mercy Ships has worked in more than 70 countries providing services valued at more than $1.53 billion, treating more than 2.71 million direct beneficiaries. The Africa Mercy is crewed by 400 volunteers from up to 40 nations, an average of 1,000 each year. Professionals including surgeons, dentists, nurses, healthcare trainers, teachers, cooks, seamen, engineers, and agriculturalists donate their time and skills to the effort. With offices in 16 nations, Mercy Ships seeks to transform individuals and serve nations one at a time. For more information, go to www.mercyships.org.